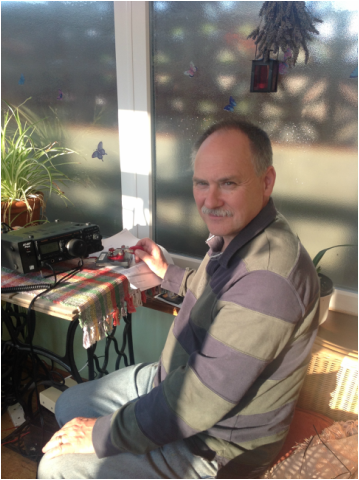 Here Iam with my previous radio in my last qth in Anthorn, enjoying the sun in the conservatory. ​I have been in Amateur radio for many years, I first started as a Short Wave Listener where i had an old valve radio, then moved on to a Tandy radio and then on to a Yaesu FRG7 - I studied and took the City & Guilds in Amateur radio becoming a G8 call, I then went to Hull Maritime College where i took the morse code exam then got my G4. Years ago I used to be a morse examiner for the Western Isles but my morse skills have gone, I wish i could get back into that but I think i would need to buddy up with someone local to me to do that and as far as i know there isn't anyone near me. I used to envy a friend of mine in Scarborough, no longer with us unfortunately - He used to be a telegraph officer in the navy. When i went round to his shack he would never write down morse, he would just wonder around his shack listening, then reply, at a speed i could hardly copy one word! AMAZING! The hobby now is completely open, price wise, to all, providing you have an Amateur radio licence. You can buy a very cheap VHF hand held transceiver for about £30 to an all singing and dancing all band transceiver for thousands of pounds. There are also many ways of using the bands now, HF of course, my favourite, VHF, UHF, modes like D-star, Fusion (built into the FT991) plus many many digital modes, too many to mention. I am now retired from the NHS, now recovering from spinal operations i should soon be able to go sea fishing again. ​As well as the FT991A I have an FT990AC HF radio and a pretty simple shack.